Tayport dished out a recent beating to Carnoustie. Tayport boss Stevie Kay says putting the smile back on his players’ faces has been key to their recent run of excellent form. 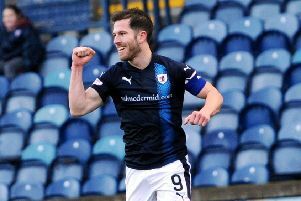 ‘Port are comfortable in fifth place in the McBookie.com East Superleague, four points ahead of sixth place Kennoway Star Hearts. They will have a chance to extend that gap when the two meet at Treaton Park this weekend. And they’ll head into the game with a spring in their step. “We’re unbeaten in five and scoring a few goals as well,” said boss Kay. “The players all have a smile on their face. “If anything, I’d like to see us closing out games a lot quicker than we are and instead of winning 1-0 we win 3-0 or instead of winning 2-0 we win 5-0. “We’re a young side and there’s maybe a bit of bravado when we get in front, but we still need to work on killing games off and closing the back door completely. “There’s still this problem of not winning the second half. With one eye on next season, Kay reckons his Tayport side can achieve great things with just a sprinkling of experience. The Canniepairt boss has watched on this season as his young side adapted well to the East Region Superleague. And he reckons some key additions ahead of the next campaign can see them surge even further up the table. Kay said: “I’ve been speaking with the chairman about breaking into the Dundee market. “I know all of the clubs and players really well in Fife but, in Dundee, they’re all speaking with Lochee or Broughty, where a lot of them still remember Jamie McCunnie (manager) from playing with Dundee United. “I want a chance to speak to these players first and pull them away from that to tell them about Tayport, what we want to do and the history of the club. “We have a young squad and, if we can keep them together for a couple of seasons, then we’ll be in a really healthy place. We’re going in the right direction. Tayport haven’t pulled up any trees on the road this season and are yet to record their first league win away from the Canniepairt. They have a chance to right that wrong this weekend, and there would be no better time to do it than in a Fife derby against Kennoway at Treaton Park. Kay added: “Kennoway have picked up since changing their gaffer. “They’ve had a few injuries but I’m not fooled by that, they’re a good team.